Today is my one year anniversary since Chaysing Dreams has been published. Wow! What a ride. When I first released Chaysing Dreams, it was more out of curiosity to see if anybody would like it. I thought all I had to do was to write the three books and share the story of Tess and Chayse to the world. Was I wrong! I had no idea that your work doesn’t end once a book is published. I probably average 20-30 hours per week on writing, reading, and marketing. Most of my marketing efforts have been online. I honestly have had no time to go anywhere personally to get the word out except for a few book signing events I attended. So, now that I’ve been in this “book” world for about a year, I sat back and reflected on all that I’ve accomplished. I have my own website! jalpawilliby.com I try to post something weekly if possible. But who would have thought that I was going to have my own website? I now have a Facebook page, twitter, and I just started Pinterest. Believe it or not, I have over a thousand followers on both Facebook and Twitter. Before all this, I had no knowledge of social media. I was forced to learn a lot—and you know what? I’m glad I did because let’s face it. The world is changing… and like it or not, social media is not going anywhere any time soon. I’ve got three trailers out on You Tube for Chaysing Dreams. Two are official trailers and one is a fan made trailer. I don’t know about you guys, but I’m a very visual person. Watching trailers is kind of like watching the miniature version of your book. 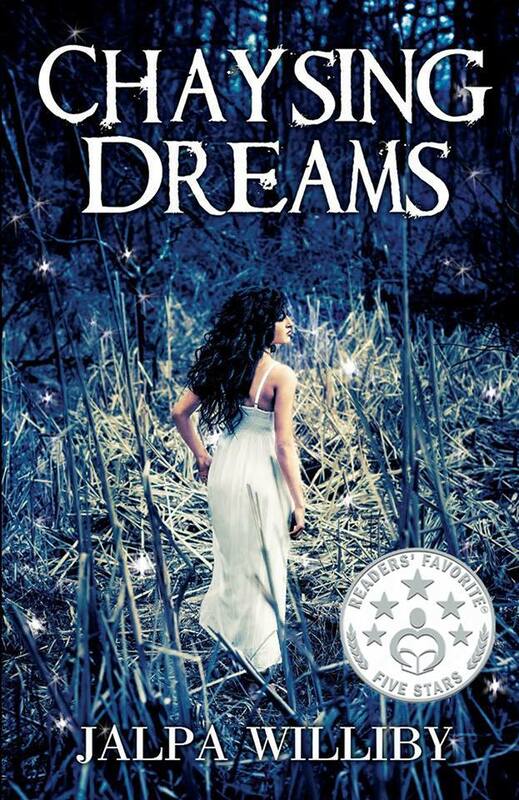 Chaysing Dreams was on the Amazon best seller list several times. 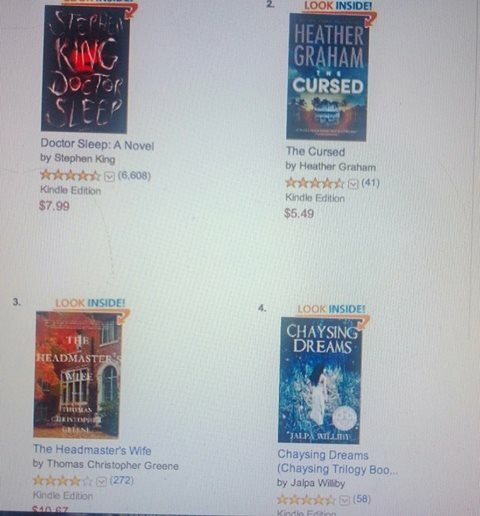 Here’s a picture when Chaysing Dreams was ranked just three behind Stephen King. It received the five star seal from Readers’ Favorite. Three different reviewers read the book and all three gave it five stars. When those reviews came back, it felt pretty damn good. As of date, Chaysing Dreams has sold 452 copies (includes the paperback and the eBooks) No, it’s not thousands or anything. But to be honest, I was just expecting some close friends and family to buy it. The fact that strangers are buying it and liking it makes it all worthwhile. It has won “Book of The Month” recognition from Book Review Depot. This group is full of some amazing authors. So, I felt pretty awesome to be voted by them. More recently, it is a Readers’ Favorite International Book Award finalist in three categories. (Romance General, Romance Suspense, and Fiction Chick Lit). For me, this is completely not the type of recognition I would have expected. I know it’s tough to even be a finalist for these types of awards. If I win any medals from this contest, I’m going to Miami to accept my prize! I have 68 reviews on Amazon (4.8 out of 5 ratings)… I have 55 five star reviews, 11 four star reviews, 1 three star, and 1 one star. I realize that not everybody’s going to LOVE what I wrote- that’s life. But overall, not bad, right? The best part of this experience: I have met some pretty cool people. I’ve gotten some loyal fans who contact me regarding my books. I’ve also met some great authors who are more than willing to share their experience and knowledge. So for now, I’m going to keep on moving forward. It may be at a slow pace, but it’s better than standing still. I’m just glad that I had enough courage to put something out there, not knowing how it was going to be received. Trust me, that’s a very intimidating feeling… you never know if the reviews will be positive or negative. One year! I made it through one year! Go me! For me, every bit matters. Every reader matters. Every review matters. Every recognition matters. I’ll keep taking the baby steps because you know what? 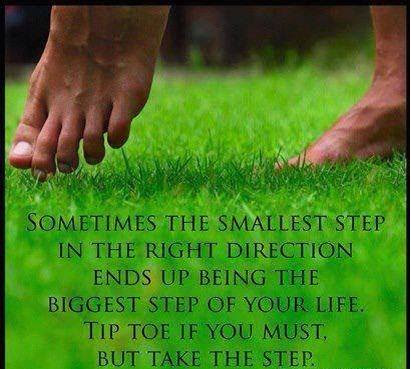 Every step matters. Posted on August 9, 2014, in Uncategorized and tagged Amazon best seller, Chaysing Dreams, Finalist, five stars, Jalpa Williby, One Year Anniversary, Readers' Favorite, sales. Bookmark the permalink. 2 Comments. Congratulations, Jalpa! I’ve often wondered how other indie writers fared in their first year. Not many could or would publicly announce their progress; but, not many have been as successful as you have been. Fantastic achievements, all well deserved. I’ll be looking forward to next year’s summary and a comparison that’s sure to double or triple your first years accomplishments.